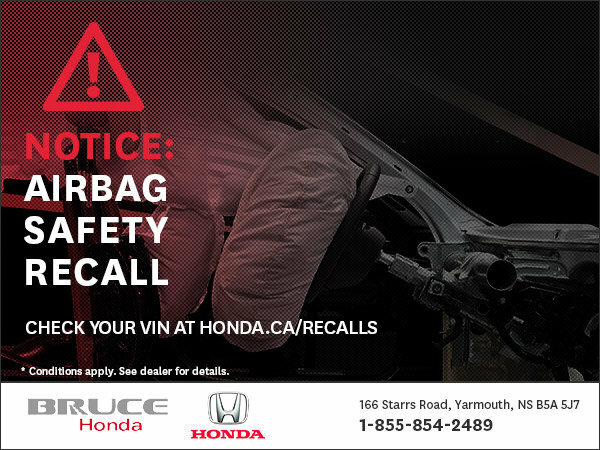 Due to a recent safety recall on the TAKATA airbags present in a variety of Honda vehicles, we strongly encourage you to take note of your Honda vehicle's VIN number and check it at the Honda.ca website. You can do so at http://honda.ca/recalls, or simply by clicking one of the buttons below. For any further questions or comments, don't hesitate to contact Bruce Honda or Honda Canada today.